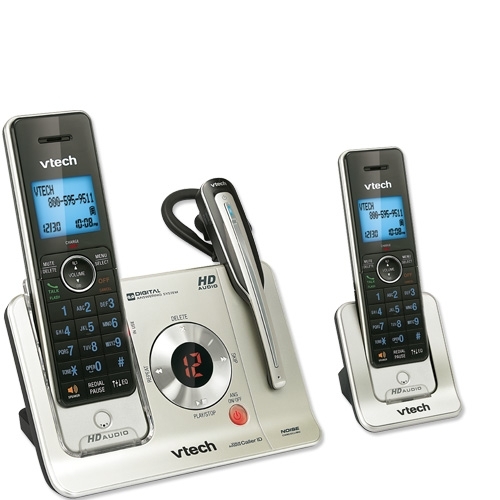 Refined style and innovative features define the VTech LS6475-3 cordless phone system. With two handsets and a DECT 6.0 cordless headset, you can have a private hands-free conversation anywhere at home. Plus, Push-to-Talk technology allows you to use the handsets like walkie-talkies, instantly communicating with any or all of the handsets in the system. No need to shout to be heard at home anymore. HD Audio provides fuller and clearer sound, while a Voice Announce Caller ID feature improves call screening by audibly announcing the name and number of the caller on the base unit and all the handsets. DECT 6.0 Digital technology delivers superior sound quality and range, and also prevents wireless networks and other electronic devices from interfering with conversations. With 14 minutes of recording time, the digital answering system answers calls when you can't. The VTech LS6475-3 can expand to 12 cordless handsets and 2 cordless headsets. For the busy parent this phone was an amazing piece of technology as it truly does free up your hands to do the things you need to be doing without the worry of holding the phone while you are working around the house. So you have the ability to multitask while still talking to your friends and family. On top of this you get a crisp quality sound quality in the device and the device itself is very comfortable to wear. The headset also has quite the range, so you do not have to worry on whether you are inside or outside, you can rest assured that you will have some distance when it comes to wearing and using the headset itself. I tested out the distance at my own home and I was able to go to my neighbors house and back without a problem. I did also use it in my backyard (which is a bit large) and found the quality to still be adequate and the call was kept intact. Overall, I was quite impressed and love the fact that you can continue adding to this system if need be in the future (up to 12 phones). If you are looking for a high quality phone that will not let you down, look no further than this one! Originally published on 2012-05-16 by Davis at Dad of Divas .